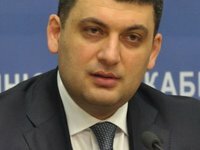 Deputy Prime Minister – Minister of Regional Development, Construction, Housing and Utilities Economy Volodymyr Hroisman has been appointed to the post of acting prime minister of Ukraine, Interior Minister Arsen Avakov has said. "Volodymyr Hroisman has been appointed acting prime minister at the government meeting," Avakov wrote on Facebook on Thursday evening. Ukrainian Prime Minister Arseniy Yatseniuk announced from the rostrum of the Verkhovna Rada on Thursday that he is resigning. "I announce my resignation in connection with the breakup of the coalition and blocking of the government initiatives," Yatseniuk said, speaking at a parliament sitting on Thursday evening. Yatseniuk headed the government on February 27, 2014 after parliamentary coalition of deputy factions European Choice was formed. Verkhovna Rada Chairman Oleksandr Turchynov said during the evening plenary meeting that the European Choice coalition stopped existing officially. The coalition's breakup will give president grounds to dissolve the Verkhovna Rada and to hold early elections if one is not reformed within 30 days. On July 24, Verkhovna Rada Chairman Oleksandr Turchynov has officially announced the dissolution of the European Choice parliamentary coalition in Ukraine's parliament. Earlier on Thursday, the UDAR, Svoboda factions and 19 independent MPs announced their exit from the coalition in the Verkhovna Rada. If no new coalition is formed within 30 days following the previous one's dissolution, this would entitle the president to dissolve the Verkhovna Rada and call early parliamentary elections.